How do leaf anatomies and photosynthesis of three Rhododendron species relate to their natural environments? Rhododendron is one of the most well-known alpine flowers. In order to identify performances relating to Rhododendron’s natural habitats we investigated the leaf anatomical structures and photosynthetic characteristics of R. yunnanense, R. irroratum and R. delavayi, which showed different responses after being transplanted into a common environment. When compared with R. irroratum and R. delavayi, R. yunnanense had lower leaf dry mass per unit area (LMA) and larger stomata, but smaller stomatal density (SD) and total stomata apparatus area percent (At), lower stomatal conductance (Gs), transpiration rate (Tr), light compensation point (LCP), light saturation point (LSP), light-saturated photosynthetic rate (Amax) and leaf nitrogen content per unit area (Na). LMA was positively correlated with Amax and maximum rates of carboxylation (Vcmax). However, leaf N content was not significantly correlated with Amax. Thus, the variation in leaf photosynthesis among species was regulated largely by changes in LMA, rather than the concent of nitrogen in leaf tissue. R. yunnanense plants are vulnerable to moisture and light stress, while R. irroratum and R. delavayi are better suited to dry and high radiation environments. The present results contribute to our understanding physiological trait divergence in Rhododendron, as well benefit introduction and domestication efforts for the three species of Rhododendron studied in this work. Rhododendron is one of the most well-known alpine flowers. The genus of Rhododendron contains 1000 species distributed in Asia, Europe, and North America. China has the most diverse Rhododendron flora with 571 species; 320 species of which occur solely within the Yunnan province of Southwestern China (Fang et al. 2005). However, the distribution of many species is usually narrow in Yunnan province. For example, R. oxyphyllum and R. yunnanense are mainly distributed in mixed forests on slopes, whereas R. wardii and R. irroratum are found in evergreen broad-leaved forest or mixed forest, and R. decorum, R. siderophyllum and R. delavayi are found in thickets, hills, rocky slopes or single-species constitute the forest (Fang et al. 2005). Because of its popularity, the demand of Rhododendron genus as an ornamental plant has been increasing in recent years. Large-scale cultivation under controlled conditions is necessary to meet this rising demand. Successful cultivation and continued use of wild species require knowledge of their requirements for optimal growth (Cui et al. 2004). However, few studies have examined the growing conditions of Rhododendron, such as water availability, temperature, nutrient availability, and photoprotective cover for overwintering (Cordero and Nilsen 2002; Scagel 2007; Wang et al. 2009). Photosynthesis is widely used as a tool for indicating environmental stress and selection of growth conditions suitable for different species (Weng and Ueng 1997). The knowledge of leaf structural and physiological characteristics of species and how these triats relate to their physical habitats is essential for introduction and domestication programs (Guan et al. 2011; Zhang and Yin 2012), and subsequent commercial production. Indeed, although several numbers of Rhododendron have been cultivated for centuries, it is still not an easy task because the optimum growing condition remains unclear. Species’ distribution patterns reflect trait-habitat interaction and determined by the plant ecological functions. Plant structure is the basis of function, so the differences and changes of structure will inevitably affect physiological and ecological function, and thus, the adaptability of plants to a changing environment (Kikuzawa 1995; Poorter and Bongers 2006). After transplanting from their natural habitat to the nursery in Kunming without any protection measures, Rhododendron species exposed to these different environment (hotter, drier and more radiation) showed divergent responses. For example, R. yunnanense grew poorly, with its leaves exhibiting significant light damage, such as leaf chlorosis and sun burn spots, while R. decorum and R. delavayi maintained normal growth, but with reduced flower size. The growth and development of plants in such different environments depends on their physiological tolerance, which in turn, relates back to their original habitats. R. delavayi and R. irroratum are mainly distributed in evergreen broad-leaved forests margins, whereas R. yunnanense grow in mixed forests on shaded slopes. Consequently, the most obvious difference of their nature habitat is that R. delavayi and R. irroratum are subjected to stronger light intensity than is R. yunnanense (Fang et al. 2005). We hypothesized that the difference in light intensity influences the distribution of these species of Rhododendron. Light is one of the most important driving forces of leaf photosynthesis, which in turn determines a plant’s growth, survival and fitness. In response to changes in light environment, plants acclimate to different light availabilities mainly through changes in leaf anatomical features (particularly changes in leaf mass per unit area, LMA), or by changes in biochemical features (particularly leaf nitrogen content and leaf nitrogen partitioning among different photosynthetic machinery), or both (Feng 2008; Evans and Poorter 2001; Lin and Hsu 2004). However, ecological studies have generally focused on anatomical features without distinguishing changes in leaf nitrogen content, and physiological studies have concentrated on the importance of biochemical changes without considering the importance of changes in structure (Le Roux et al. 2001). The relative importance of these anatomical and physiological variations within a given plant material is not well understand (Le Roux et al. 1999). The leaves of a plant are the main apparatus for photosynthesis and respiration, and closely link with the surrounding environment. In the evolution of plants, leaves are the most sensitive organs and the plasticity is the largest to the environment. Leaf structural features contributing to the maintenance of the high CO2 concentration in the chloroplast stroma may have been selected during evolution (Dunbar-Co et al. 2009). Therefore, the research for leaf traits indicative of leaf performance is crucial to understanding of the ecological function and the distribution of plant species (Vendramini et al. 2002; Pandey et al. 2009). In this study, we investigate leaf anatomical structure and photosynthetic characteristics of three Rhododendron species that showed different responses when grown under the same environment. Our aim was to identify their divergent performances relating to natural habitat, and evaluate the relative importance of leaf anatomy and physiology in relation to their natural habitats. The relationships between leaf anatomy and physiological aspects are particularly emphasized. Three year old plants of R. yunnanense, R. irroratum and R. delavayi were collected from their natural habitats in the east of Yunnan province, China (alt. 1500-2409 m, E 103°42′-104°34′, N 24°20′-25°00′). This site has a subtropical mountain climate, and the main vegetation is conifer and broad-leaved mixed forest. The ecological characteristics and biological traits considered are shown in Table 1 in Fang et al. (2005). Three Rhododendron species were cultivated in a nursery in Kunming, China (a1t, 1926 m, E 102°46′, N 25°07′) after collected them from the field. The mean annual temperature and mean annual rainfall were 14.5°C and 1035.3 mm, respectively. The seedlings were grown into 3-L plastic pots (one plant per pot) filled with a laterite-humus (V/V, 1/3), shaded by a nylon net to give 40-50% of full sunlight, and then watered and fertilized as needed to ensure non-limiting water and nutrient supply. After cultivation for 18 months, the plants were used for measurements in the present study. Gas exchange measurements were made on the fully expanded, mature leaves using a portable LI-6400XT photosynthesis system (LI-Cor, Lincoln, NE, USA) equipped with a red/ blue LED light source (6400-02B) in July 2010. The response curve of net photosynthetic rate (An) to irradiance (PAR) was determined at light intensities (0–1600 μmol m−2 s−1). During measurements, leaf temperature (Tleaf) was controlled at 20°C, CO2 concentration (Ca) and relative humidity (RH) in the cuvette were held at 370 μmol mol−1 and 60-70%, respectively. An-Ci curve was determined with a range of CO2 concentrations (0–2000 μmol mol−1) under a controlled light intensity (800 μmol m−2 s−1). Tleaf and RH were controlled as the same with An-PAR curves. Three mature leaves from three individual plants per species were selected for photosynthetic measurement. An, stomatal conductance (Gs) and transportation rate (Tr) were recorded automatically during measurements. Water use efficiency (WUE) was calculated as dividing An by Tr. Values of Gs and WUE were measured at Ca of 370 μmol mol−1 and PAR of 800 μmol m−2 s−1. Light-saturated photosynthetic rate (Amax), dark respiration rate (Rd), light saturation point (LSP) and light compensation point (LCP) were calculated from the An-PAR curve with a three-component exponential function (Watling et al. 2000): An = a(1-e-bx) + C, where An is photosynthetic rate, x is PAR, a, b and C are constants. Maximum rates of carboxylation (Vcmax) was estimated from the An-Ci curve with Photosyn Assistant software (Dundee Scientific, Scotland, UK) that applied the biochemical model described by Von Caemmerer and Farquhar (1981). The values of Vcr and Jmc at 20°C were equal to 12.6 μmol (CO2) g−1 (RuBPCO) s−1 and 131.9 mol (electron) mol−1 cyt f s−1, respectively. Nm was mass-based leaf nitrogen content (%). The PNUE was calculated as Amax / Na. 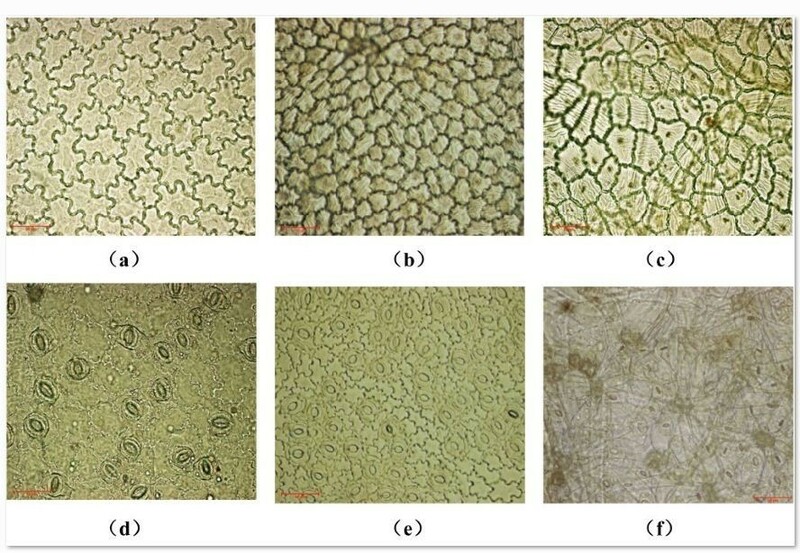 Small pieces from the middle region of the leaves were fixed in FAA (formalin/ glacial acetic acid/ 50% ethanol, V/ V/ V, 5/ 5/ 90) for at least 24 h, then dehydrated by gradient ethanol, cleared in xylene, and then embedded in paraffin for sectioning. 8-μm thick sections were cut using a Microm HM 315 rotary microtome (Microm Laborgeraet GmbH, Germany) and then mounted on glass slides. The samples were examined and photographed using a Nikon Eclipse E800 light microscope (Nikon, Melville, NY, USA). Cuticle, epidermis, mesophyll, palisade tissue, spongy tissue and leaf thickness were measured with image ProPlus 6.0 software at 400× magnification (Media Cybernetics, Inc., Sliver Spring, MA, USA). Small sections cut out from the middle section of leaves (ca. 0.5 × 0.5 cm) were placed in a 50% sodium hypochlorite solution until the leaves turned white, and then peeled adaxial and abaxial epidermis after washing with distilled water and photographed under a light microscope. Digital images were analyzed with ProPlus 6.0 software at 400× magnification. The stomatal density (SD), stomatal apparatus area (As) and total stomatal apparatus area percent (At) were calculated as follows: SD = N/ S, AS = 1/4 × π × l × w, At = AS × SD × 100%. N denotes the number of stomata, S is the area of observation, and l and w are the stomatal apparatus length and width. Three leaves from three individuals were examined for each species, and more than ten images per leaf were analyzed. Statistical analysis was performed with SPSS 13.0 (SPSS Inc., Chicago, USA). Difference between means were tested by one-way ANOVA and LSD multiple comparisons tests. Difference was considered significant at p < 0.05. All graphs were carried out in the software SigmaPlot for windows version 9.0 (Systat Software, Inc.). Leaf thickness (LT) of three Rhododendron species varied from 243.98 to 262.42 μm, with R. yunnanense having the thickest leaves (262.42 μm). Adaxial epidermis cell thickness (ETad), abaxial epidermis cell thickness (ETab) and mesophyll tissue thickness (palisade and spongy tissue thickness, PT and ST) contributed to higher leaf thickness of R. yunnanense (Table 2). However, cuticle thickness (CT) and ratio of palisade and spongy tissue (PT/ST) were lower in R. yunnanense. R. delavayi had the lowest LT and highest PT/ST, whereas R. irroratum was in the middle (Table 2). Mean ± SE (n = 50) LT, leaf thickness; CT, cuticle thickness; ETad, adaxial epidermis cell thickness; ETab, abaxial epidermis cell thickness; PT, palisade tissue thickness; ST, spongy tissue thickness; PT/ST, ratio of palisade and spongy tissue; SD, stomatal density; L, stomatal length; W, stomatal width; As, stomatal apparatus area; At, total stomatal apparatus area percent. Different letters in the same row indicate statistical difference (p < 0.05). Adaxial epidermal cells of three Rhododendron species are rectangular or ellipse and closely arranged in two layers of cell (Figure 1). The shape of epidermal cells of R. yunnanense and R. irroratum were wavy (Figure 2a and b), whereas R. delavayi had polygon-shaped epidermal cells (Figure 2c). Oval stomata were only found on the leaf abaxial surface among the three Rhododendron species (Figure 2). There were significant differences in stomatal characteristics among the considered species. The stomatal density (SD) and total stomatal apparatus area percent (At) were lowest in R. yunnanense, and highest in R. delavayi. Stomatal length (l), stomatal width (w) showed opposite trends with SD and At (Table 2). Leaf cross sections of Rhododendron yunnanense (a), R. irroratum (b), and R. delavayi (c) under light microscope. Cu, cuticle, Ad, adaxial epidermis, PT, palisade tissue, ST, spongy tissue, Ab, abaxial epidermis, S, stomata. I, indumentum. Scale bars 50 μm. Adaxial epidermis (a-c) and abaxial epidermis (d-f) of Rhododendron yunnanense (a, d), R. irroratum (b, e), and R. delavayi (c, f) under light microscope. Scale bars 50 μm. R. delavayi and R. irroratum had higher Amax, LCP, LSP, Rd, and Vcmax, and were significantly different from R. yunnanense (p < 0.05) (Table 3). However, there were no significant differences between R. delavayi and R. irroratum. Furthermore, R. yunnanense had the lowest intercellular CO2 concentration (Ci) at atmospheric CO2 concentration of 370 μmol mol−1 among the three species (Table 3), possibly a result of lower Gs (0.144 mol m−2 s−1). Lower Gs also resulted in lower Tr in R. yunnanense, and therefore improved water use efficiency (WUE). R. delavayi and R. irroratum showed opposite trend with R. yunnanense, and with higher values of Gs, Ci, Tr and lower value of WUE. Amax, light- saturated photosynthetic rate; LCP, light compensate point; LSP, light saturate point; Rd, dark respiration rate; Vcmax, maximum rate of RuBP carboxylation; Gs, stomatal conductance; Ci, intercellur CO2 concentration; Tr, transpiration rate; WUE, photosynthetic water use efficiency. Different letters in the same row indicate statistical difference (p < 0.05). LMA of R. irroratum was significantly higher than R. yunnanense, but similar to that of R. delavayi (Table 4). R. yunnanense had the lowest value of Na and highest value of Nm, while PR, PB and PNUE were highest in R. delavayi, but there was no significant difference among three Rhododendron species except for Nm. R. irroratum had the highest value for chlorophyll content per area (Chl), but the lowest ratio of chlorophyll a to b (Chl a/ b). LMA, leaf mass per unit area; Na, leaf nitrogen content per unit area; Nm, leaf nitrogen content per unit mass; PR, the partitioning coefficients of leaf nitrogen in RuBPCO; PB, the partitioning coefficients of leaf nitrogen in bioenergetics; PNUE, photosynthetic nitrogen use efficiency; Chl a+b, chlorophyll content of a and b; Chl a/ b, the ratio of chlorophyll a and b. Different letters in the same row indicate statistical difference (p < 0.05). There was a strong linear correlation between LMA and photosynthetic capacity, as estimated by Amax and Vmax, although there was no significant relationship between Amax and N content either base on leaf area or leaf mass (Figure 3). 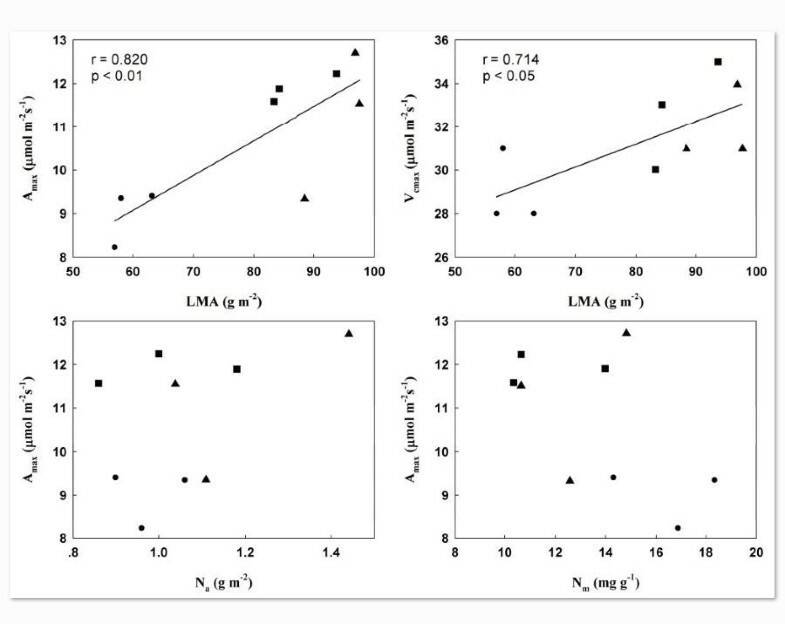 In addition to relating with photosynthetic capacity, LMA showed a negatively correlation with Nm or WUE, and a positive correlation was found between LMA and Gs (Figure 4). Correlations between leaf dry mass per unit area (LMA) and light-saturated photosynthetic rate (A max ) or maximum rates of carboxylation (V cmax ); and between A max and leaf nitrogen content per unit area (N a ) or leaf nitrogen content per unit mass (N m ) in three Rhododendron species. “●”, “▲” and “■” stand for R. yunnanense, R. irroratum and R. delavayi, respectively. Correlations between leaf dry mass per unit area (LMA) and leaf nitrogen content per unit mass (N m ), stomatal conductance (G s ) and water use efficiency (WUE) in three Rhododendron species. “●”, “▲” and “■” stand for R. yunnanense, R. irroratum and R. delavayi, respectively. Plants often exhibit considerable variations in their functional traits that affect the capture and utilization of resources and enable them to adapt to changing environments (Guan et al. 2011). Cuticles can reduce water loss from the leaf to the atmosphere, and considered as an ecological characteristic for plant confront to high light and drought. The cuticle of R. irroratum was thicker than R. yunnanense, whereas R. delavayi did not have a thicker cuticle than R. irroratum. However, the abaxial surface of R. delavayi with 1-layered spongy, or somewhat agglutinated indumentum (Figure 2f), can reduce water loss from the leaf interior and prevent light damage, and thus increase water use efficiency and maintain normal leaf physiological function (Mill and Stark Schilling 2009). The results indicate R. yunnanense is vulnerable to moisture and light stress, whereas R. irroratum and R. delavayi may be better suited to drier and brighter habitats. Stoma effectively regulates gas exchange where water vapor leaves the plant and CO2 enters. The stomatal distribution, density, size, morphology and behavior are closely associated with environmental factors (Schlüter et al. 2003). The significantly negative correlation found between stomatal size and stomatal density in three Rhododendron species, i.e., R. delavayi with more densely but smaller stomata and R. yunnanense showed opposite trends (Table 2). 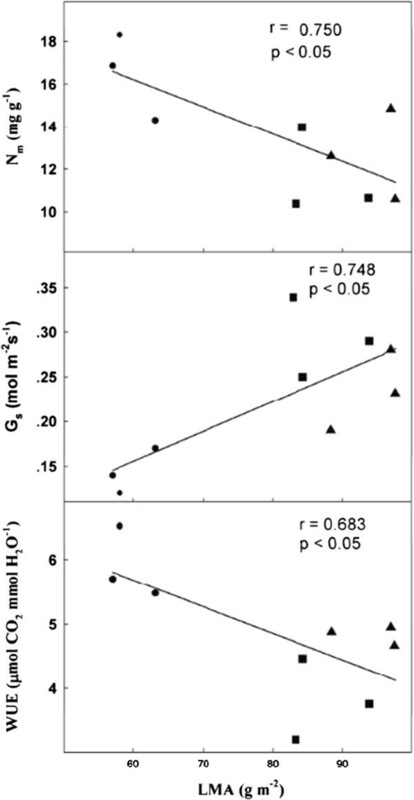 Stomatal density is closely related to water availability and light intensity (Cai et al. 2004). Generally speaking, strong light and water deficit lead to more densely but small stomata (Xu and Zhou 2008). Small stomata enable the leaf to attain high and rapid diffusive conductance under favorable conditions, and they afford greater water use efficiency in dry habitats because they can react more quickly to environmental stimuli (Franks et al. 2009). By contrast, larger stomata are slower to close and have a greater potential for hydraulic dysfunction under conditions of drought, however, this lag in response may be advantageous in cool, moist, or shaded environments (Aasamaa et al. 2001). The results indicated that R. delavayi with more densely but smaller stomata may have a strong ability to regulate water/CO2 and may be better suited to more arid and high light environments than are R. yunnanense or R. irroratum. This is consistent with our observation of these species’ natural habitats. LMA is a key structural trait that measures plant investment and is widely used as an indicator of plant ecological strategies (Westoby et al. 2002). 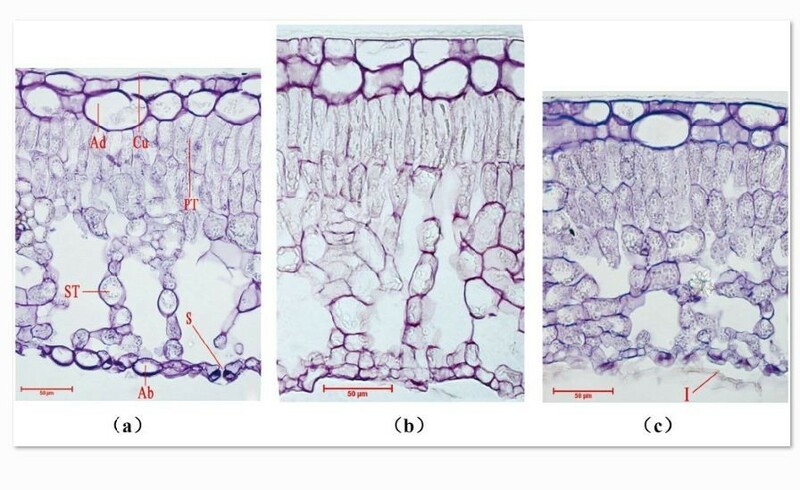 A high LMA was associated with high leaf thickness and more structural tissue, and has been interpreted as a property to drought or high light environment (Salleo and Lo Gullo 1990). However, in present study, LMA didn’t show a positive correlation with leaf thickness. LMA of R. yunnanense was significantly lower than R. delavayi and R. irroratum (Table 4), but its leaf was thicker. Leaf mesophyll (palisade and spongy tissue) mainly contributed to a thicker leaf (Table 2). Witkowski and Lamont (1991) point out that both leaf thickness and density may account for changes in LMA and both traits may vary independently. Moreover, anatomical structure underlying variation in leaf density and thickness may differ depending on the nature of the species and their environment (Garnier and Laurent 1994; Van Arendonk and Poorter 1994; Poorter et al. 2009). Castro-Díez et al. (2000) found LMA in 52 European woody species was correlated with leaf density but not with thickness. Greater LMA across these species set as greater allocation to support and defense functions, as shown predominantly by species from resource-poor environment. Light has been justified as the main factor determining a plant’s survival, growth, and fitness. Upon exposure to a wide range of light regimes, plants show an ability to meet these differing conditions, mainly by alterations in leaf structure and biochemistry (Evans 1989; Niinemets and Tenhunen 1997). LCP and LSP of R. delavayi and R. irroratum were higher than R. yunnanense, indicating their photosynthetic apparatus can operate well in higher light environment and benefiting to survival and occupy higher light habitats. The study of Nilsen et al. (1988) about R. maximum also reported that in the open environment, the rate of light saturated photosynthesis was reached earlier in the day than that of low light environments. For shade-tolerant R. yunnanense, lower LCP, LSP, and Rd would benefit greater net carbon gain in low-light, and suggest this species may be a strong competitor in low-light environments. Because more than 50% of total leaf nitrogen is allocated to the photosynthetic apparatus, total leaf nitrogen content affects the biochemical efficiency of assimilation (Evans 1989). Generally, the leaves on plants grown under low light have more nitrogen content per mass than those exposed to high light, this is because shade leaves contain less mechanical tissue per unit area than do sun leaves (Evans and Poorter 2001). Our studies also yielded similar results. R. delavayi and R. irroratum had higher Na than R. yunnanense, whereas Nm showed opposite trend. However, we didn’t find a close linear relationship between Amax and leaf nitrogen content, both in the terms of Na and Nm (Figure 3). Previous studies showed that under high irradiance, the photosynthetic rate is co-regulated more by investments of leaf N to carboxylation and electron transport (i.e., PR and PB) compared with low irradiance (Hikosaka and Terashima 1996). In the present study, the three Rhododendron species studied had relative constant PR and PB values, but R. delavayi and R. irroratum had higher Amax and thus effectively enhance PNUE (Table 4). Efficient nitrogen use in photosynthetic machinery in accordance with the environment may enhance the fitness of these species in infertile habitats (Hassiotou et al. 2010). These results may imply that R. delavayi and R. irroratum have a broader ecological niche than R. yunnanense, however, leaf N content and leaf N reorganization did not meaningfully influence their physiological performance. The differences in photosynthetic capacity reflected the differences in leaf anatomy, physiology, and biochemistry. Stomata can effectively regulate gas exchange where water vapor exits the plant and CO2 enters. Leaf conductance, photosynthetic carbon gain and the potential transpiration rate are primarily determined by both stomatal aperture and density (Brodribb and Jordan 2011; Büssis et al. 2006). The stomata of R. delavayi and R. irroratum were more densely packed and smaller than R. yunnanense, and as a result, stomatal conductance and transpiration rate were nearly twice that of R. yunnanense (Table 3). As the ability of leaves to quickly open stomata and increase conductance may allow greater rates of carbon fixation to occur, so densely and small stomata partly contributed to larger stomatal conductance, and consequently higher photosynthetic rate of R. delavayi and R. irroratum. Leaf structure as indicated by LMA was also positively correlated with Gs and photosynthetic capacity of the three Rhododendron species. The plant with higher LMA usually had greater surface area of leaf chloroplast (Smes) or mesophyll cells facing intercellular air spaces per area (Sc), and consequently, mesophyll conductance and photosynthetic capacity (Terashima et al. 2001; Oguchi et al. 2003; Piel et al. 2002). Our study demonstrates that high Smes and Sc were mainly due to thick palisade tissue. Notably, palisade thickness along with Sc may enhance the capture of photons on an area basis. Furthermore, the high Sc can enhance the diffusion of CO2 from the surface of mesophyll cells to chloroplasts, resulting in the positive correlation between Sc and Amax (Oguchi et al. 2005). However, other studies have suggested that high LMA has been associated with low mesophyll conductance, which can restrict the rate of CO2 assimilation (Terashima et al. 2006; Hassiotou et al. 2009). The negative effect of LMA on gas exchange can arise from changes in internal anatomy and an increase in the diffusion resistance of CO2 from the substomatal cavity to the chloroplasts (Niinemets 1999). Leaf surface properties including wax layers, epidermal cell shape, cuticular thickening, trichomes, mesophyll cell wall thickness and stomatal crypts contribute to high LMA, and can alter leaf structural properties and thus influence gas exchange (Terashima et al. 2005; Terashima et al. 2006). Changes in LMA are caused by variations in internal anatomy, and there may also be secondary effect on foliar N content or N allocation to the photosynthetic machinery (Garnier and Laurent 1994). High LMA is often associated with more structural tissue and lower nitrogen content, but whether this is simply due to ‘dilution’ by the presence of more structural tissue, or also applies to the photosynthetic apparatus is not well understood (Hassiotou et al. 2010; Hikosaka 2004). In the present study, a negative linear relationship between LMA and Nm and a positive relationship between LMA and Amax were found in three Rhododendron species, but N content didn’t show significantly correlation with photosynthetic capacity either base on leaf area or leaf mass (Figure 3). The results suggest that more structural tissue in the three Rhododendron species, resulted lower mass-based nitrogen content, and changes in leaf photosynthesis, but importantly, these results did not arise from disparate N partitioning within leaves. However, in a comprehensive study of 25 species covering a 10-fold range in LMA, Harrisonlk et al. (2009) showed that the fraction of nitrogen allocated to cell walls is independent of LMA, and the relationship between the fraction of nitrogen allocated to Rubisco and LMA is curvilinear. These relationships between leaf N and leaf structure may arise because under field conditions, differences in stomatal conductance may dominate photosynthetic functioining, whereas differences in N content and internal leaf anatomy have only a marginal effect on photosynthetic functioning Mediavilla et al. (2001). In conclusion, three Rhododendron species exhibited significant differences in leaf anatomical and physiological characteristics related to their natural habitats. When compared with R. yunnanense, the divergence in leaf anatomical structures and physiological functioning of R. delavayi and R. irroratum reflected stronger ecophysiological performance to a higher light and drier environment. Variation in leaf photosynthesis across species was associated with variation in LMA, but not leaf nitrogen. This work is financially supported by the Science and Technology Foundation of Yunnan (2011 EB110) and the Open Foundation of the Key Laboratory of Yunnan Flower Breeding (FKL-201003). C-YF, L-SF and L-SF designed the experiments together. C-YF measured photosynthesis, related leaf traits analyzed data. L-SF and L-SF investigated natural habitat and managed experimental materials. X-WJ made the observation of leaf anatomy, S-J made the observation of stomatal traits. All authors read and approved the final manuscript.